A FAIRYTALE garden tucked away in Bellbird Park will enchant Gardening Australia (GA) viewers next year. GA presenter Jerry Coleby-Williams this week highlighted the stand-outs in Antonia McCaskie's eclectic and extensive collection of plants. Ms McCaskie's garden, which she has named Mother Nature's Laughter, is a well-blended mix of English garden flowers, Australian natives, rare evergreens and more. Mr Coleby-Williams said the unexpected combination of plants worked well. 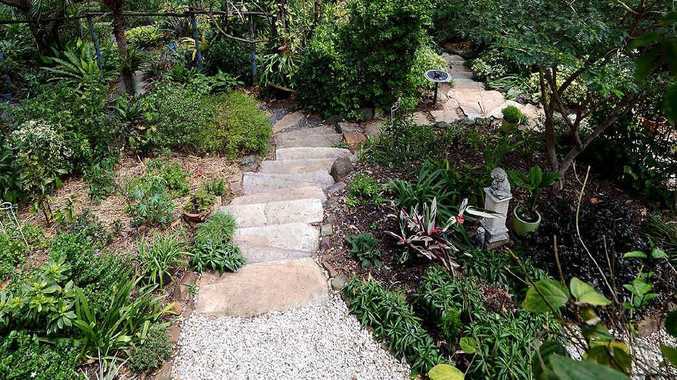 "This garden is diverse; it shows the richness of things you can grow in south-east Queensland, like the blanket flowers that normally grow in colder climates, for example," he said. "I especially like the natives, Antonia has grown a rare rainforest tree that is probably a better specimen than the one in the Sydney Royal Botanic Gardens." Ms McCaskie said her garden had special spiritual meaning. "I grew up in Holland and was very keen on flowers as a child, so I love the paint-box of flowers in the front garden," she said. "I suppose it shows the colour of youth, and then you move down the slope of the garden past the mural to the halfway gate, and down into the rainforest area, where it's more reflective. "It's the way things flow together that I love; further down the hill there a house of reflection with mirrors, and a bridge of tranquillity." Ms McCaskie said the garden was about 18 years old, with many full-grown trees having been grown from tube stock. "I had a vision to grow the garden when I had cancer and I had just lost my sister to it, and I started my garden then," she said. "I think it's taught me patience, and to just enjoy the moment. "Gardens are like kids, there's good times and bad times." Mr Coleby-Williams congratulated Ms McCaskie on her garden design. "The garden's been built on a sloping site with compost areas at the top, which is very clever," Mr Coleby-Williams said. "Antonia's strategically hidden them, and all the products of the compost are being used rather than running off." To find out more about Ms McCaskie's garden, visit the Open Gardens Australia website or tune in to Gardening Australia when it airs next year. Mother Nature's Laughter will open to the public on selected dates in March 2013.